What better place to start looking for kitchen inspiration, than in a celebrity chef’s kitchen? Take a peek into celebrated chefs’ homes; you’ll find that their knowledge of the culinary arts doesn’t end at creating delicious food, but seeps through into their interior spaces. The result is practical, restaurant-inspired kitchens worthy of the best home-made meal. 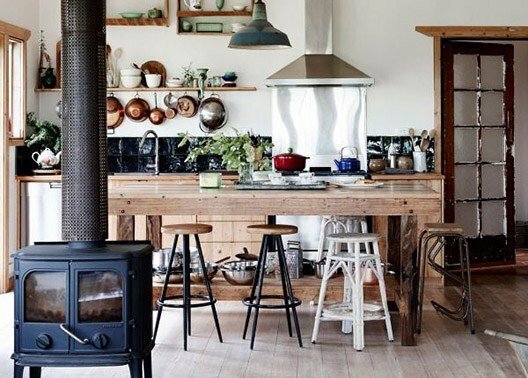 Here is our list of celebrity kitchens for beautiful home cooking inspiration. A regular on Great Chefs, Bobby Flay is renowned for his cooking shows on Food Network and a natural behind a grill. It’s surprising that it took Flay three decades before he spoiled himself with a working grill at home. The casual atmosphere of their family home in the Hamptons culminates in a beautifully designed kitchen that feels and looks a bit like an upmarket bistro. Stunning brass pendants complement the bright aquamarine cabinetry. The addition of woven rattan café chairs gives the sleek and sophisticated space a relaxed and beach-side air. This is the perfect kitchen for entertaining! New Orleans-style chef, Emeril Lagasse incorporated the global experience he gained as host of Eat the World with Emeril in his coastal Florida home. The Lagasse home is filled with neutral tones and beachy aesthetic. Soft blue touches hint to Mediterranean interiors, but the kitchen has the look of a sophisticated Greek beach villa; white cabinetry, a marble-finished extractor fan, dreamy Azul Bahia granite countertops and a delicate glass chandelier tops off this luxury chef’s kitchen. The state of the art refrigerator will put many restaurant kitchens to shame. French traditionalist, prolific restaurateur and philanthropist, Daniel Boulud’s home kitchen is a modern minimalist’s dream. The spacious layout is a great improvement on the initial kitchen, where Boulud and his partner found it difficult to cook together. With the insight and help from architect Stephanie Goto, the seamless Caesarstone countertop and handle-less cabinetry add to the streamlined and efficient quality of the kitchen. A great deal of attention went into the hidden details and special drawer features. This is what keeps this kitchen’s counter-space as uncluttered and minimal as possible. Italian-born chef and television personality, Giada de Laurentiis, marked the original kitchen as the reason why she decided to transform their 1600 square-foot home in Los Angeles into a contemporary space. The kitchen captures the essence of the home; organised, sleek and modern with a touch of warmth. With the help of designer Kevin Fitzsimons, de Laurentiis and her husband now have a superbly equipped kitchen. The enormous fridge and pantry, designer pendant light and large kitchen island will please even the most discerning crowd. Esteemed and respected Michelin Star chef, Brad Farmerie has renovated his home kitchen in New York to display his eclectic décor finds. The acclaimed chef is an avid souvenir collector and loves to exhibit his diverse finds. In Farmerie’s kitchen, the black and gold Lacanche oven steals all the attention. The piece is both practical and exquisite and seems almost too beautiful to use. The white cabinets, metro tile and light countertops form an elegant canvas from where the contrasting black oven can be wholly admired. The kitchen of restauranteur and chef, Galen Zamarra, is a light and inviting space. Here, floating shelves and dark flooring are welcome additions to a minimalist white backdrop. The metro tile, red colour pops, and gold finishes against panelled cabinetry and gold shelving brackets give this interior a well-travelled look. This is, of course, reminiscent of Zamarra’s French-American cooking style. Like many other chefs’ kitchens, the oven acts as the visual feature; here a restrained colour scheme frames Zamarra’s much loved DeLonghi double oven. The exotic roots and adventures of Tariq Hanna are nowhere more evident than in his New Orleans abode. The acclaimed pastry chef’s house was built in the 1830s on a sugarcane plantation. This is what instantly drew Hanna and his wife to the property. Their galley kitchen feels like it belongs in a small, family-run bistro. This is also exactly how it’s used, as Hanna cooks for the family (which includes three French bulldogs) six days a week. Pale green cabinets and light “disco sparkle” Caesarstone brightens and visually enlarges the small space. Here it’s clear to see that no matter the size of the space, it is never too tiny to fit an industrial sized oven – or so a chef might reason. If you know Barefoot Contessa, then you know Ina Garten. A self-taught chef, she relied on friends and family as food critics as she expanded her culinary skills to become a well-known cookbook author and host of Barefoot Contessa. This cottage kitchen perfectly suits Garten’s home-style cooking; off-white cabinets and rustic metal fixtures add to a down-to-earth feel – perfect for relaxed family entertaining. The kitchen island features an impressive six-burner oven mounted to a butcher’s block, with an adjoining concrete countertop. Homey, straightforward cottage-styles form the core of Garten’s interiors. This is also evident in her other home choices such as The Barn in New York. Massive ovens, easy-to-clean surfaces and the perfect layout are all present in these practical yet beautiful kitchens. And if that works for pro chefs, it can certainly work for anyone.